I am sure that everyone reading this is aware that Guardian Teen Books recently celebrated a week focussing on diversity in books for children. And there you have it: the criterion must be the quality of the literature. I see little value in writing or publishing books to satisfy some sort of quota to reflect the percentages of ethnic or racial populations or other minorities. The Guardian published a list of 50 books chosen to represent all manner of cultural diversity, from the amazing Amazing Grace by Mary Hoffman to Oranges in No Man´s Land by Elizabeth Laird. Here are a few of my favourite books that are outstanding in every way and that also open windows on to different ways of seeing the world. Persepolis by Marjane Satrapi, is a graphic novel based on her experiences during the cultural and political upheaval of the Iranian revolution after the overthrown of the Shah. This is a real eye-opener from the first pages showing tiny girls swathed in unfamiliar and unwanted veils in their school playground. 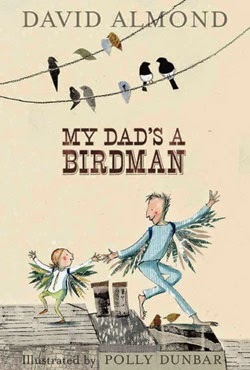 My Dad´s A Birdman, by David Almond, illustrated joyfully and colourfully by Polly Dunbar, is a terrific book about a young girl and her dad who is so overwhelmed with grief that he goes off the rails. It is suffused with love and tenderness and faith in the act of flying as Dad and daughter take part in a madcap and magical contest to sprout wings and fly across the river. starting 5th grade after years of home schooling: imagine how he is dreading it - “I won´t describe what I look like. Whatever you´re thinking, it´s probably worse. From Tangerine Books, a wonderful picture book, Larry and Friends, by Ecuadorian illustrator Carla Torres in collaboration with Belgian/Venezuelan writer Nat Jasper celebrating the modern melting pot that is New York. 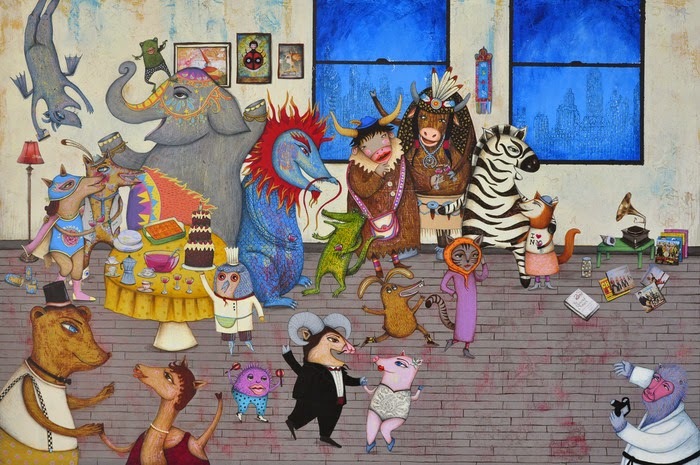 Larry, the New York dog, holds a party for all his amazing immigrant friends among them Magpa the pig from Poland who became a tightrope artist, Laila the Iranian entomologist, Edgar the Colombian alligator street musician, Ulises, the Greek cook and a host of other talented and tolerant newcomers to the city – all apparently based on real people and how they met up. The book project was successfully funded by kickstarter – see more about it here. 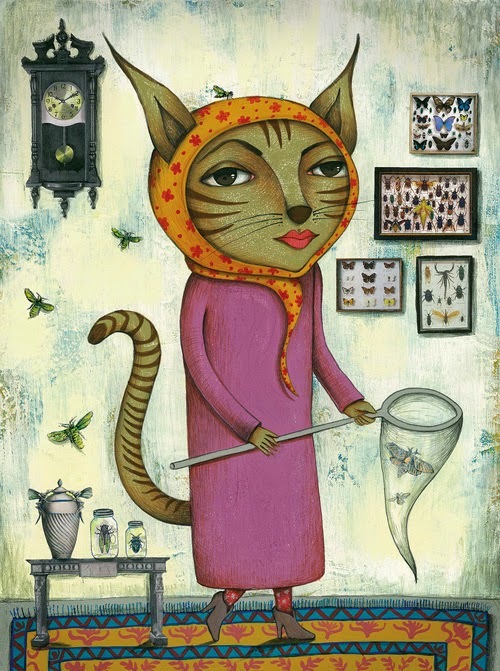 As you can see, the illustrations are divine - this is Layla, the Iranian entomologist who works at the museum. 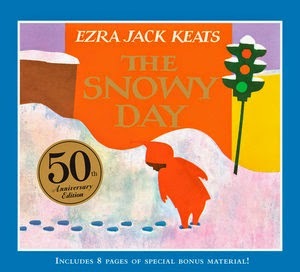 And finally, another great classic is The Snowy Day by Ezra Jack Keats (1963), possibly one of the earliest American picture books to feature a young African-American hero – although this is never mentioned in the text. It simply tells the story of a young four year old boy discovering snow in the city for the first time. Thanks for this - most of these are new to me. One of my all time favourite books is "Whistle for Willie" - also by Ezra Jack Keats - with the same little African-American boy. I loved The Snowy Day as a child. I can remember the lump in my throat when he tries to keep the snowball in his pocket, when I knew what would happen to it. The pictures are amazing. 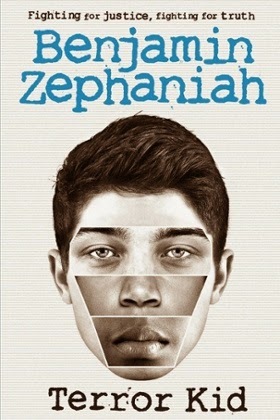 A book that has really stayed with me. Oh Sue, you are in for such treats! Catdowunder, I don't know Whistle for Willie - will look out for it. I agree absolutely with you caroljchristie - the story is so wonderful and the collage technique simple but so effective. A joy. I am only familiar with two of these - I read Wonder on the recommendation of one of the younger members of my family, thought it very good, but I absolutely LOVED Arrival! Not one word in it, yet it tells a beautiful, joyous, heartbreaking story. I can smugly say that I was lucky enough to see bits of it up on a screen at a science fiction convention when Shaun Tan was still working on it, and I got to see a stage version of it. Beautiful book! Hear hear, Sue Bursztynski. Actually, every single book by Shaun Tan is beautiful, wondrous, thought-provoking, surreal, miraculous - and there is room in his world for everyone from language student aliens to lost monsters.